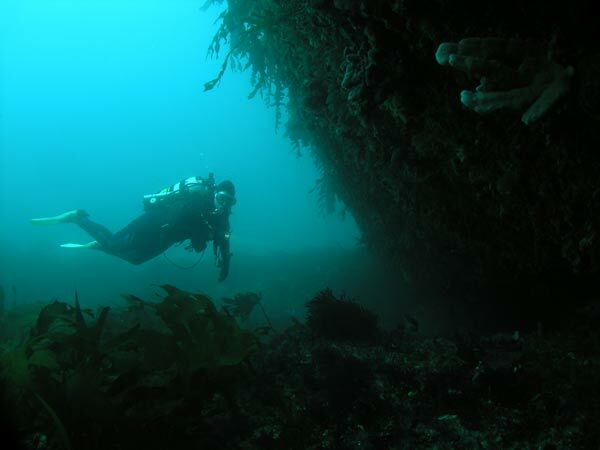 While most Australians like to head to warmer climates for their diving holidays, the eastern and south-eastern coastline of Tasmania has some excellent temperate water diving that you will encounter in the world. In fact, the diving there is better than many so called "hot" coral reef dive locations. In March 2009 Kelly and I made our fourth trip to Tasmania and our second to Bicheno on the East Coast. 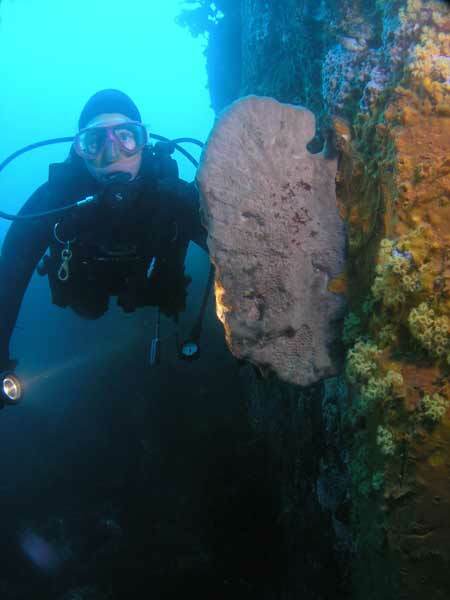 As well as diving a couple of spots we did here in 2008, we did five new sites. One of these is called 27B. Now, I have no idea where this name comes from, as it does not get to 27 metres and I forgot to ask Bruce the dive operator. Like most of the sites here, 27B is located on the northern side of Governor Island. It is only a three minute run from the boat ramp to the dive site. This is located off the north-western end of Governor Island at GPS Reading 41º 52' 14.7"S 148º 18' 55.6"E (using WGS84 as a datum). 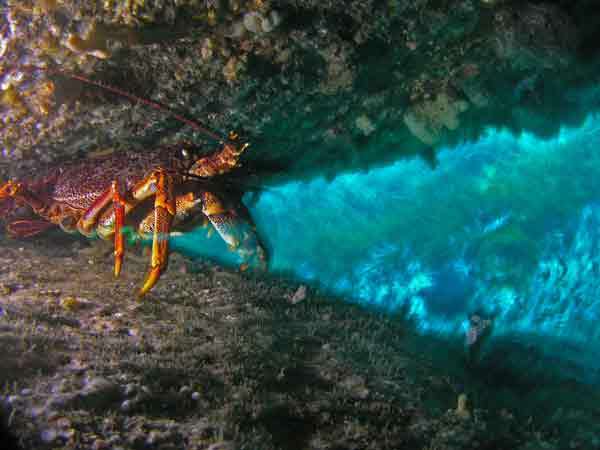 The dive spot is located south-west of a smaller rocky island, between the rocky island and the main island. You descend to the top of the reef at about eight metres and follow the wall of the rock to the east and north-east. There is a bit of an overhang here which has abalone and crayfish. The section of reef here is sort of a gully, with the rock on the right sloping down towards the deeper section near the rocky island. While swimming along I saw a small whitish eagle ray. You get a little deeper as you go and after about 20 metres you come to a small drop-off. This drops to 18 to 20 metres. The wall goes to the north but our dive plan was to head to the south. We followed the wall as it ran roughly south. The bottom was mostly kelp. Here and there are large rocks off the main wall. These have a bit more colour on them, with some nice sponges. All along the wall there are hundreds of abalone and crayfish. About 40 metres or so from the start of the wall there is a large cave. This has even more crayfish in it, one I saw was huge, with legs the diameter of a thick sausage (hard to think of something to compare it to!). The wall continues to head mostly south, but there are some spots that head more east. The boulders are still prevalent. The depth gets to about 23 metres along the wall. Around here we decided to finish the dive and did a free ascent to five metres before surfacing and being collected by the dive boat (nearly all dives at Bicheno are live drops). 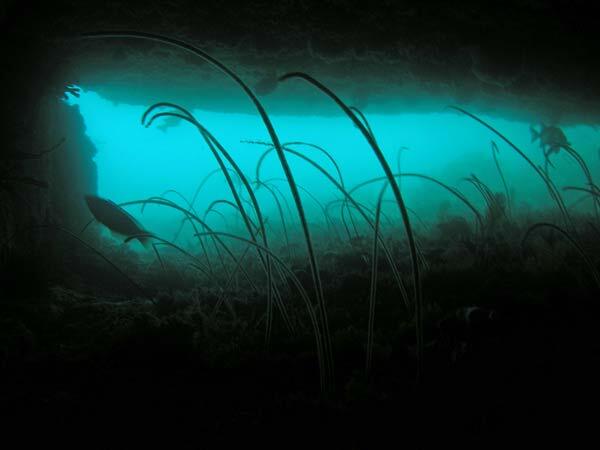 This is not the best dive site I have dived at Bicheno, but it is still nice. The visibility was about 12 metres and the water temperature in late February was 16ºC. I used the services of Bicheno Dive Centre and can thoroughly recommend Bruce.